When Nebraska heads to Indiana on Oct. 15 it will be making its first trip to Bloomington as a member of the Big Ten. The Hoosiers will welcome the Huskers for homecoming while wearing a new alternate uniform the school and Adidas announced Wednesday. Inspired by the first candy stripe designs that Doc Counsilman and Hobie Billingsley used to better spot their legendary 1960's and 1970's swimming and diving teams at the pool, and later adopted by the 1971-72 basketball team, the retro look was designed in concert between Indiana Athletics and adidas Football to encapsulate the history and significance of the design that ushered in a historic era and created iconic identity for the university. 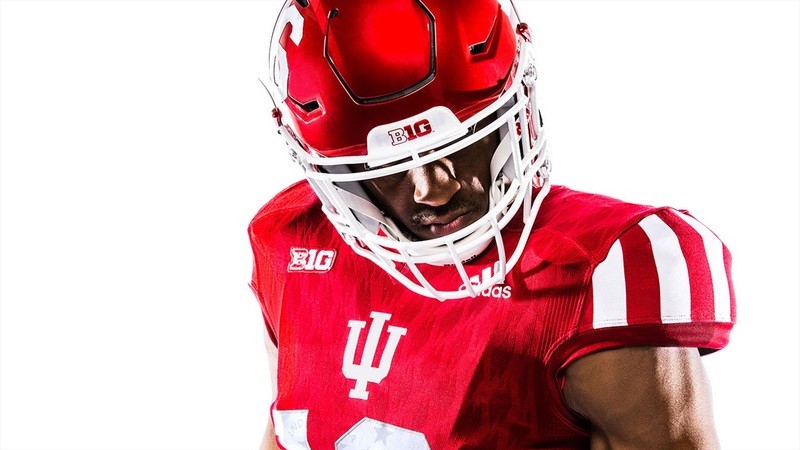 Combining innovation with style and detailing, the special edition uniform is centered around the iconic crimson and white colors of the Hoosiers' athletic programs. Starting with a crimson jersey, the sleeves are highlighted with candy stripes that pay homage to the aesthetic featured on the Hoosier basketball team's warm-ups. Next, an oversized 'Script Indiana' logo, made popular by being on the back of the basketball warm-up shirts, is highlighted in crimson on the leg of the white pants and offset with crimson socks and white cleats to create a head-to-toe candy stripe theme. Real talk: There are a lot of ways a "Candy Stripe" uniform could've gone wrong, but this one is just right. Limiting the actual stripes to just the sleeve caps is great way to nod towards tradition without making things garish. The helmet numbers are a nice, simple switch from what Indiana typically wears on its helmets (the Hoosiers have many options, some of them are good). Throw in some subtle nods to the state flag and you've got a really solid alternate uniform.